Jury selection begins Tuesday in the federal court trial of Paul Manafort, though the charges do not involve his time with Trump. 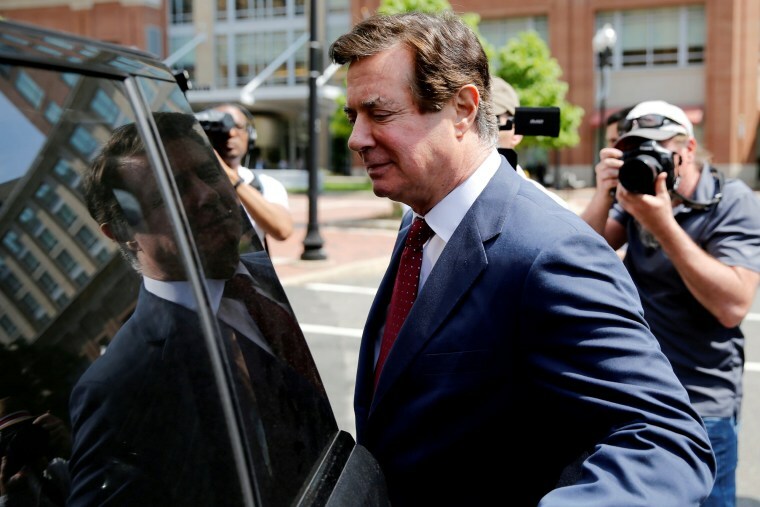 WASHINGTON — Jury selection begins Tuesday in the federal court trial of Paul Manafort, a former chairman of Donald Trump's presidential campaign. It's the first case brought by special counsel Robert Mueller to go before a jury. The charges do not involve Manafort's time with Trump. Instead, they stem from Manafort's work for the Russian-backed government of Ukraine and its former president, Viktor Yanukovych, an ally of Russian President Vladimir Putin. But if Manafort is convicted, prosecutors would have powerful leverage for attempting to compel his testimony before a grand jury about whether he knows of any improper dealings between the Trump campaign and the Russians. The trial itself is not expected to shed any light on Russia's election meddling. "I don't anticipate that a government witness will utter the word 'Russia,'" said Greg Andres, a member of the Mueller team, in a pre-trial hearing. For nearly a decade, prosecutors say, Manafort made tens of millions of dollars advising Ukrainian politicians and lobbying on their behalf. But the charges say he hid at least $30 million of that income to avoid paying U.S. taxes, stashing it in banks in the United Kingdom, Cyprus, and the island nation of St. Vincent and the Grenadines in the Caribbean. The indictment filed against Manafort accuses of him of using "his hidden overseas wealth to enjoy a lavish lifestyle in the United States," spending nearly $2 million on antiques and almost $1.5 million on clothes for himself. Prosecutors say he spent millions more buying and remodeling houses in New York, Florida, and Virginia. Mueller's team says when the income from the Ukraine work began to dry up, Manafort lied about his income and made other false claims to get nearly $25 million in bank loans on those properties. Prosecutors have offered immunity in order to secure the testimony of five people involved in some of those banking transactions. A key prosecution witness will be Richard Gates, Manafort's former business partner — a man Mueller's team says was heavily involved in hiding the money. He pleaded guilty to reduced charges in February and agreed to cooperate with the government. "They were partners," said Chuck Rosenberg, a former federal prosecutor in Alexandria, Virginia, where the trial will be held. "They were colleagues. They traveled together. They did business together. So largely what Manafort knows, Gates knows. That's crucial." Much of the courtroom time will be spent slogging through financial records. "Gates will be there to round out the testimony. So it's very important to the government to have him available as a witness," Rosenberg says. During his three months as Trump's campaign chairman, Manafort defended his overseas lobbying as intended to promote democracy. "The work I was doing in Ukraine was to help Ukraine get into Europe, and we succeeded," he told Chuck Todd on "Meet the Press." His lawyer, Kevin Downing, has said little about the merits of the charges. On the day Manafort was arrested last fall Downing said, "The claim that maintaining offshore accounts to bring all your funds into the United States is a scheme to conceal from the United States government is ridiculous." Downing mounted a vigorous attempt, however, to have the case thrown out, arguing that charging Manafort was beyond the scope of Mueller's authority as the special counsel appointed to investigate Russian interference in the 2016 election. Judge T.S. Ellis declined to dismiss the charges but injected a note of skepticism about the government's case. "Those involved should be sensitive to the danger unleashed when political disagreements are transformed into partisan prosecutions," he said in his ruling. On Monday, Manafort agreed to drop a civil suit challenging Mueller's authority. The suit was dismissed earlier this year, but Manafort's legal team appealed the decision. On Monday night, his lawyers notified the court that both the Justice Department — including Mueller and Deputy Attorney General Rod Rosenstein — and Manafort had agreed to drop the case. A spokesperson for the special counsel's office had no comment. For the past month, Manafort has been in jail awaiting trial. His house arrest was revoked after he was accused of trying to influence potential witnesses. During his first appearance in the Alexandria courtroom last week, he wore a green jail jumpsuit. But the judge ordered that for the rest of the trial, court officials must allow him to be dressed in a suit and tie. If convicted, Manafort, 69, faces up to 10 years in prison. And no matter what happens in this trial, which is expected to last about three weeks, he faces similar charges brought by Mueller in federal court in Washington.